At St Vincent’s, we teach a broad and balanced, Creative Curriculum which is based around exciting cross-curricular projects and meaningful, stimulating tasks. Our aim is for all children to become confident, successful, life-long learners who achieve their full God-given potential. Provide thorough coverage of the skills, concepts and knowledge set out in the 2014 National Curriculum programmes of study (Classes 1 to 6) and the Early Years Foundation Stage Framework (Nursery and Reception). Themed Weeks: Each half term, the whole school also participates in themed weeks planned to develop a particular aspect of the curriculum in an exciting, interactive way. These include Enterprise Week (business and innovation skills), Anti-Bullying Week, Science & Engineering Week, World Week (global awareness), Art Week and Health & Fitness Week. 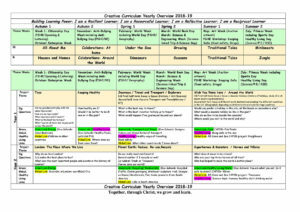 The curriculum for each Year Group can be found on the relevant Year Group pages. Each Year Group has an age appropriate Learning Journey for Reading , Writing and Maths detailing the relevant National Curriculum objectives to be achieved by the end of the year. 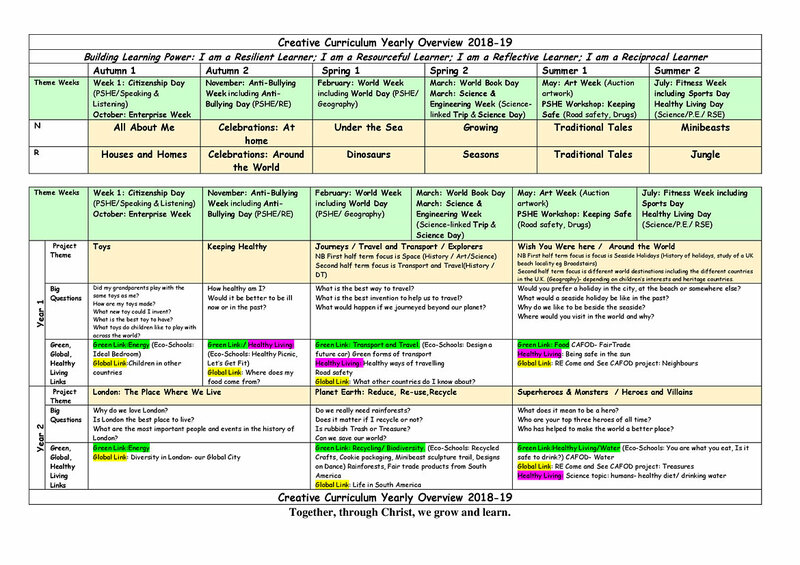 A termly Information Sheet provides more detail and links to the Creative Curriculum. Please speak to the classteacher if you would like more information. View the Yearly Creative Curriculum Overview PDF 2018-19. At St Vincent’s, we place a high priority on children acquiring a sound grasp of the phonics system and being able to apply this when reading and writing. From Nursery to Year 2, we use the scheme Letters and Sounds to teach Daily Synthetics Phonics. Parent workshops, homework books and class Meet the Teacher sessions provide extra information on how we teach phonics. The Nelson Handwriting Scheme is a consistent whole-school handwriting programme for Reception–Year 6 which introduces letters in line with Letters and Sounds and cursive handwriting in line with the latest UK curricula. From September 2016 we have been following the Maths No Problem scheme.